We have another fun #ThrowbackThursday photo to share with our readers on this Thursday. 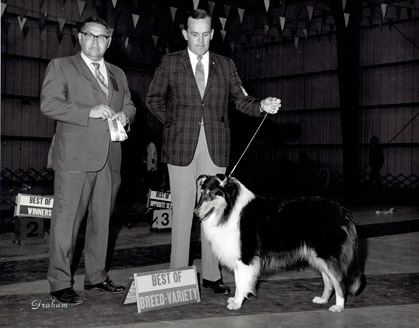 Can you guess the AKC Judge pictured in this week’s throwback showing a Collie? Check back Monday for the correct answer! The correct answer this week is Col. Joe Purkhiser. Thanks for all your participation! Don’t forget! Do you have a fun photo that you would like to share for #ThrowbackThursday? Email Cheslie at cheslie@caninechronicle.com with your photos. Posted by chesliepickett on Mar 28 2019. Filed under Featured, The Buzz. You can follow any responses to this entry through the RSS 2.0. Both comments and pings are currently closed.